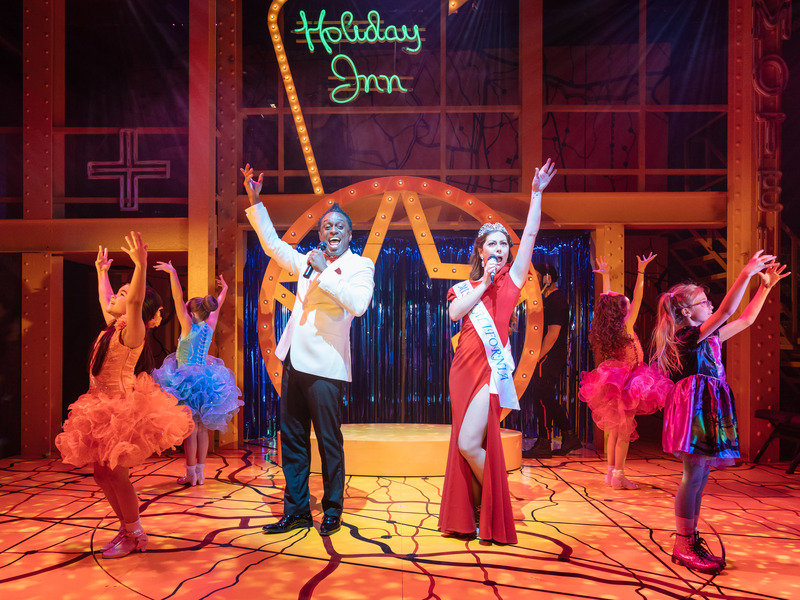 ‘A boiling down of the complex and beautiful into something more prosaic’: Lauren Mooney writes on a musical adaptation of the cult film about a dysfunctional family road trip. Little Miss Sunshine at Arcola Theatre. Photo: Manuel Harlan. Thirteen years after its cinematic release, family road movie Little Miss Sunshine is an unlikely candidate for adaptation. With a bleakly memorable sense of humour and brilliant performances, it’s a strange, lovely film – one that embraces complexity in what it says about family, love and the meaning of success. It’s not the most obvious candidate to be turned into a musical. The principles of adaptation are fascinating: why take a story from one medium to another? After all, successful art tends to be working well exactly the way it is. On screen, Little Miss Sunshine tackles an American Dream-fuelled hatred of failure in the most quintessential of American settings: the family drive through long, Californian highways, lovingly shot by directors Jonathan Dayton and Valerie Faris; they have chance meetings at gas stations; they argue in motels. What does this new form – not only a stage show but a musical – offer us, in terms of extending the film’s story, its meaning? Unfortunately, not much. James Lapine and William Finn’s adaptation has already had a brief run Off Broadway, and now receives its European premiere at the Arcola Theatre, ahead of a UK tour. Lapine and Finn are hugely successful collaborators – they each won a Tony, Score and Book respectively, for Falsettos in 1992 – but there’s not much evidence of that spark here. Despite a running time of nearly two hours, I couldn’t have whistled a single tune from Little Miss Sunshine by the time I was on the tube home. Two hours isn’t that long for a musical, but it feels it here. The film comes in about the same length, but it’s got a lot more air: it’s full of uncomfortable silences and long, desolate shots of West Coast desert. That’s not a luxury this production, directed by Mehmet Ergen, has – but there isn’t much to replace it with. The result is that things feels dragged out beyond what’s sustainable. As in the film, the musical follows a dysfunctional family, the Hoovers, as they drive from Albuquerque to California so their youngest daughter, Olive, can compete in a children’s beauty pageant, Little Miss Sunshine. Everything is about the same as the film, plot-wise – but when an adaptation is too faithful, you start to wonder what the point is of having made it. The characters are so familiar that it’s strange to see someone else performing these parts, but singing, and things veer once or twice towards the unintentionally parodic. What departures there are from the original are often difficult to parse. In the film, Olive’s teenage brother Dwayne is his mother’s child from a previous marriage – here, the parents’ marriage is the one great love affair of both their lives, we even get a flashback song to their teenage courting. It’s all simplification, a sanding down of the film’s complexities, and if you take away enough of the small pieces of grit that made those characters feel real, what are you left with? Fun Home, which ran at the Young Vic last year, was a great argument for what the musical form can do for unlikely candidates. In that show, about memory and distance and family, songs were able to dig down into fleeting moments of experience, analysing and transforming memories, allowing the music and the theatre of the piece to cohere. It’s possible to make brilliant musicals from unlikely source materials – but Little Miss Sunshine doesn’t use its form that way. Here, songs feel as though they bubble up simply because it’s been about the right amount of time since the last one. They’re used for exposition, but what they explain about the characters often works to pull them out of shape. That flashback song, for instance: instead of showing us a failing marriage, letting us glimpse the ghost of former happiness through what passes between them on stage, we get a flashback song to explain everything. These are the characters when they were young and happy; here is what went wrong; here is where we are now. It’s a boiling down of the complex and the beautiful into something more prosaic, and a lot of the songs seem to work in that way. When Sev Keoshgerian’s silent teenager Dwayne finally speaks for the first time – about two thirds of the way through – it’s a moment of theatre that’s built into the original material, a shock, a fundamental change to the reality we’ve accepted. But when Dwayne starts singing, his solo only drags out an emotional context that should already be clear to us. This is musical as underlining, as did-you-get-that?, and that makes it hugely frustrating to watch. Because there are moments of real comedy and warmth here. The relationship between Olive (Sophie Hartley Booth) and her Grandfather (Gary Wilmot) is as sensitively drawn and touchingly performed as in the film, and there are some really strong performances, especially from Hartley Booth and Wilmot, who gives a hugely fun turn as the family’s irascible patriarch. But mostly the show feels like a breaking open of moments that didn’t need breaking open in the first place. Still, if you want to appreciate the detail and generosity of the original film all over again, this is a good way to do that: Little Miss Sunshine serves as a reminder of how remarkable its source material really is. Maybe not every remarkable thing needs to be turned into something else. Little Miss Sunshine is at Arcola Theatre till 11th May. More details here.